We’ve all seen the movie and likely read the story. The nation’s top boffins struggle unsuccessfully to come up with the solution to a problem that could change the course of the conflict. Their repeated attempts fail. All appears lost. Then, a rank outsider comes up with a simple yet highly effective solution to the problem. The war is won and there’s a ticker-tape celebration along Broadway. Fraser Scott invented Scottoiler and started the company in 1985. Fraser Scott, the inventor of the Scottoiler motorcycle chain oiler is just that kind of design genius. With a Celtic flair for the unconventional approach to problem solving, he’s an inventor extraordinaire – without a starched white lab coat in sight. With more than 400,000 Scottoilers sold globally since the first production unit rolled off his kitchen table back in 1985, the Scottoiler has become a time-tested success story of a British made motorcycle accessory held in high esteem by (predominantly) European riders. 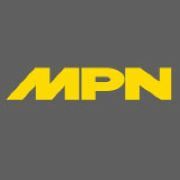 Now it is being introduced to the U.S. with the opening of a Bedford, Pennsylvania distribution center. 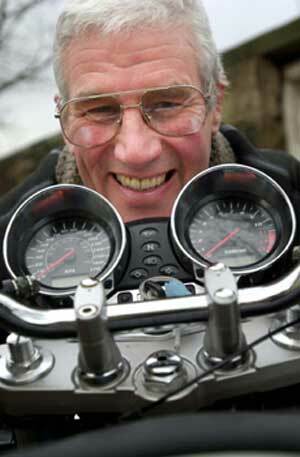 “Around 1977, I bought a Suzuki GS750 to use for a 400-mile weekly commute between Glasgow, Scotland and Manchester in the north west of England,” Fraser recalled. Mulling over the issues involved in extending chain adjustment intervals through constant lubrication, Fraser devised the first prototype of the now famous Scottoiler vSystem. Making his new invention available for sale to an initially skeptical, but quickly convinced British public in 1985. Sales of the vacuum-energized chain oiler grew steadily throughout the following decades. Such is the established success of the product that one in every 10 motorcycles on British roads is now fitted with a Scottoiler. Scottoiler CEO Fiona Scott Thompson, Fraser’s daughter. The Scottoiler clan (they affectionately call themselves the Scot-toilers) has its ancestral home and manufacturing facility in Milngavie (pronounced Mill-guy), a village nestled in the picturesque foothills of the Scottish highlands, north of Glasgow and just minutes from Loch Lomond. It’s in this idyllic setting that the “Scottish solution to chain lubrication,” crafts their 100 percent British-made product. Although the highland life may appear somewhat quaint and anachronistic to the American imagination, the Scottoiler range of products employs cutting edge design and full use of the latest technologies. 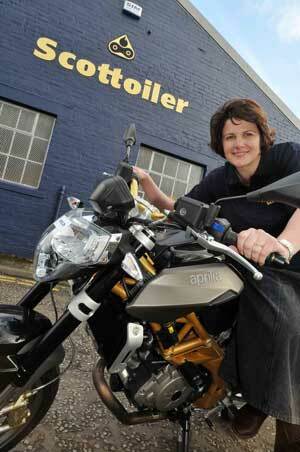 “My Father’s belief in the product means that we continue to invest and innovate, consistently backing up our products with the best possible customer support.” With two versions of the Scottoiler in production, the vacuum operated vSystem and the more recently introduced electronic eSystem, powered by the motorcycle’s battery; Fiona’s focus on providing world-class products is firmly fixed on quality and reputation. Having received numerous awards from the European motorcycle press for innovative products, the Scottoiler chain oiler caught the eye of BMW Motorrad, resulting in a co-branded BMW accessory for 2012. Fraser recalled it as being, “One of my proudest moments to be able to see the partnership with BMW Motorrad.” Recognition indeed! As Scottoiler’s U.S. Distributor headquartered in Bedford, Pennsylvania once observed: Your service techs will tell you, the most common fault found on customers’ motorcycles – along with underinflated tires – are sagging, rusty and generally neglected drive chains. The Scottoiler systems address common chain maintenance issues leading to an enhanced customer ownership experience with their motorcycle… and the dealership who sold them the product. These words ring true for dealers who are focused on customer service and retention. Owners polish their paintwork and add chrome, but have a tendency to neglect chain maintenance. Why? Well, it’s a messy and dirty task, which requires cleaning brushes, degreaser, cans of sticky spray lube and breaking out the toolbox for frequent tensioning. Either of the Scottoiler systems will keep a chain clean and in a perfect state of lubrication. No more chain destroying, black grinding paste build-up, associated with conventional spray lubricants. This means significantly fewer chain adjustments, improved chain and sprocket performance and a smoother transmission of power to the rear wheel.